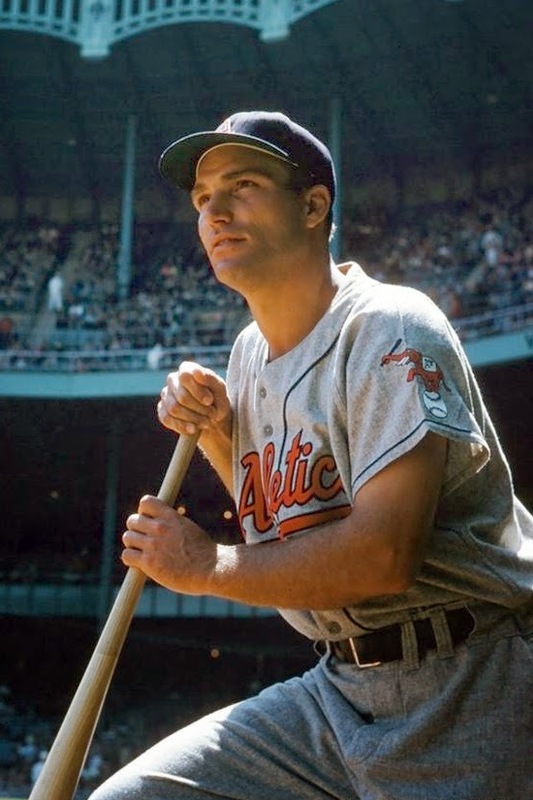 Bill Renna, outfielder for the New York Yankees, Philadelphia / Kansas City Athletics, and Boston Red Sox from 1953-1959, passed away June 19, 2014 in San Jose, California. He was 89. Renna returned from military service in World War II to become a two-sport star at the University of Santa Clara, playing outfield for the baseball team, and both fullback and center on the football team. His play on the gridiron earned him a spot in the East-West game in 1949, drawing the attention of the Los Angeles Rams; however, he chose to stick with baseball, learning under the guidance of Santa Clara’s legendary coach, Paddy Cottrell. Cottrell tipped Yankees scout Joe Devine to his prized outfielder who signed Renna in 1949 to a contract for $5,000. His signing paid immediate dividends, as he hit an eye-opening .385 with 21 home runs for Twin Falls in the Pioneer League. His play impressed his Twin Falls manager Charlie Metro, who was a former major leaguer himself. The Yankees were so impressed with Renna’s 1949 season that they sent him to their AAA team in Kansas City. Renna was hit with the injury bug injuries in 1950 and could not duplicate his torrid start from the year prior. The Yankees sent him down to Class B Norfolk, where he hit .291 with 26 home runs. “Bull” worked his way back to AAA in 1952 and played well enough to earn a promotion to the big leagues with the Yankees in 1953. Renna hit .314 in 61 games, filling in at all three outfield spots to spell Mantle and Woodling while they recovered from various ailments. While he was on the roster for their World Series championship, he did not see any action during the series. Despite being shut out during the World Series, one of Renna’s fondest memories from his rookie season with the Yankees was witnessing Mantle’s monstrous shot off of Chuck Stobbs in Griffith’s Stadium. Renna’s glory days with the Yankees would be unfortunately short-lived. In the 1953 off-season, he was part of an 11-player deal that sent Vic Power to the Philadelphia Athletics in exchange for first-baseman Eddie Robinson and pitcher Harry Byrd. Going from the perennial champs to the perennial cellar dwellers would have fazed most players, but not Renna. 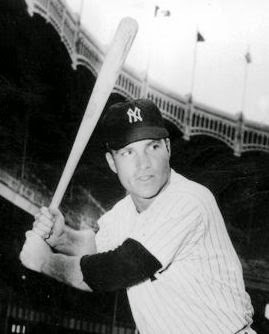 Now with the opportunity to play full-time, Renna had his best major league season in 1954. In 123 games, he hit 13 home runs while gunning out 13 runners from the outfield. He played two more seasons with the Athletics, staying with them through their move to familiar territory, Kansas City. During the 1956 season, Renna was essentially traded for himself, returning to the Yankees in exchange for Eddie Robinson. Renna got his wish, as the Yankees traded him to the Boston Red Sox for Eli Grba and Gordie Windhorn. After a monster 1957 season with the San Francisco Seals of the Pacific Coast League where he slugged 29 home runs and drove in 105 runs, the Red Sox gave him another chance at the major league life. He made the Red Sox in 1958 and spent the entire season as a backup to Ted Williams. Williams tried to impart sage hitting advice to Renna one day during batting practice, but as many that Williams attempted to council would find out, what came naturally for Williams was a struggle for most. The Red Sox sent Renna back to the minor leagues during the 1959 season and he retired after finishing out the year with San Diego. While he felt he could physically play a few more years, family responsibilities trumped his desires to continue. Renna worked with Central Concrete for over 26 years retiring in 1990, retiring to spend more time with his wife and grandchildren. Very much a student of the game, Renna looked at the current state of play in Major League Baseball with a critical eye. “When I was playing,” he said, “there were only 16 teams, as opposed to 30 now. Half of the league wouldn’t have had a shot. There are a lot of more opportunities to play in the majors now. It’s a different situation completely. It was more difficult then to make it to the majors then it is now. There were a lot more kids playing professional baseball, as there were so many leagues.